Pit bikes for sale - reasons for buying. 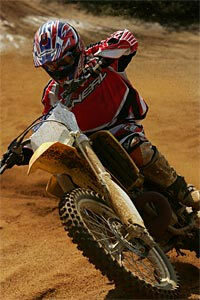 Ten Things to Think About Regarding Used Pit Bikes for Sale. New or used, pit bikes for sale are a lot of fun to look at. Most of the guidelines fall under the category of common sense, but are easy to ignore in the heat of the moment. The following things will keep you from making a serious mistake. 1. Check for leaks around the forks, which could indicate problems or a rebuild not put back together correctly. If you are comfortable taking care of this situation, just count in the expense for parts and make it right. 2. Investigate cracks on the main chassis and stress fractures on or near the plastic for further damage. 3. Check suspension, as the bike has likely been used and involved in bumps. 4. Check the oil. If it is extremely dirty, it may indicate a lack of proper maintenance. 5. Examine the tires for gashes, low pressure and unevenly worn tread. 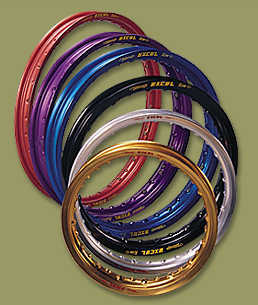 If the tires are designed for the track and you intend to do trail riding, be prepared to purchase an offroad set. The spokes should be tight. 6. Use your hand to check the kick start. It should move down nicely without grinding and growling. If you are allowed to ride any of the pit bikes for sale, hit every gear. 7. Verify that all the parts are there. 8. Find out about the ease of getting replacement parts before purchasing a used pit bike . If this purchase is for replacement parts, confirm the parts you need are in good working order and will perform as needed. 9. If the deal looks suspicious, walk away rather than buying a stolen bike. 10. Whether buying expensive or generic brands of pit bikes for sale, perform a safety evaluation. Which problems can you fix? If you cannot fix it, who do you know that can and what will it cost? Before handing over your money, find out what the frame is built from, the size of the fuel tank and the engine that provides the power. Then do an online search for reviews. It is nice to benefit from someone else's experience. Check the classified ads for good-uns! 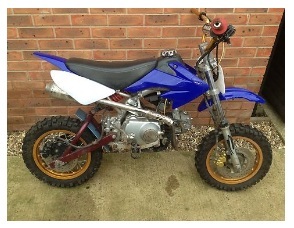 There are great offers on pit bikes for sale ; they are highly regarded by children and adults alike. EBay is a great source of bikes for sale, but local papers and clubs can be good too. Ideally someone who has looked after a bike and is upgrading is ideal, if you speak to the seller ask questions as to where parts can be obtained and how the bike performs. Maybe there are certain things to look out for and what to do when something goes wrong. Never rush into a purchase, there is so much choice around, if you miss one bike another will be around the corner – maybe better and cheaper. If it’s not the bike for you walk away and hold onto your cash, bargains are abound. 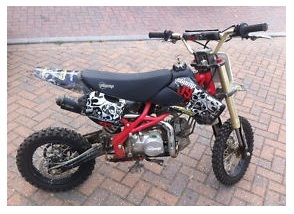 Are You Looking for Pit Bikes for Sale? If you're one of the many looking for pit bikes for sale, there are a few things for you to consider. First, do you want to purchase a new bike or is a used one good enough for your situation. There are many different reasons to purchase a bike new, but also enough for a strong argument on the side of buying one that's used. You've probably googled pit bikes for sale a dozen times and still don't have an answer to your problem. In order to make it easier, let's list the pros and cons of each type of selection. Each person's situation is different so by looking at both the positives and the negatives of each, you'll probably find the best one for your needs. Regardless of the type of pit bikes for sale, make sure you get one that's best for the rider. No matter how much you spend if the bike is too much power, not the correct size or too difficult to ride, the rider won't get much out of it. If the new bike's for your child, it could mean a dangerous piece of equipment in the hands of your youngster. If it's for you, you'll probably simply be wasting your hard-earned cash because you won't take it out of the garage if its very expensive. The dangers of Used Pit Bikes for Sale. 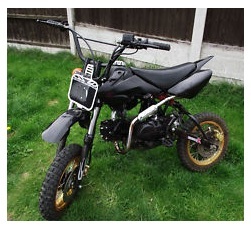 Looking for used pit bikes for sale requires some knowledge of the bikes if you want to get the best buy. You have to look for signs of good care and avoid signs that say, "I was rode hard and put away wet." All bikes require a certain amount of routine maintenance. You can check the air filter and see if it's clogged or simply look at how clean the bike is. Washing the bike, bleeding the air pressure from the forks, making sure the air filter is clean and servicing the chain and sprockets are part of the maintenance after every ride. If the rider isn't doing these basic maintenances, you'll know they aren't doing the rest such as flushing brake fluid and changing the transmission oil. Look for wear and tear on the tires too. Of course, the advantage of the used pit bikes for sale is the cheaper price. Sometimes you can find a deal, where the owner only rode the bike a few times then locked it away in the garage or in storage. In this case, you'll know by the condition of the bike and normally this type of purchase is a bargain if the price is right. Of course, the advantage of the new pit bike is the fact that no one else abused it. It's all brand new and ready for you! However, the prices can be steep and sometimes not worth the increase in investment. If you can get a quality used pit bike, choose it over a cheaper more inferior new pit bike as long as there aren't signs of lack of care on the part of the original owner. Finding the right small dirt bike for sale does take a little time. You may want a specific model such as a thumpstar or a demon. So scout around the specialised stores (online and off). When buying a ride, particularly on used models be very meticulous from the handlebars down to the dirt bike rims for damage and scrapes. Point them out to the seller - then be cheeky and ask for a bit of cash off. They can only say NO can’t they ?